IT is now several weeks since the first public demonstration was given at Cricklewood of the new Handley Page automatic slot fitted to a Bristol Fighter. In the meantime, the automatic ДальшеMore>>> slots have been or are being experimentally fitted to quite a number of aeroplanes, and some interesting test results should be available before long. One of the first machines to be so fitted was the new Handley Page "Harrow" Mark II, a torpedo or bombing machine fitted with Napier "Lion" engine, with which some very excellent results are believed to have been obtained. The machine has not hitherto been available for description, but it has now become possible to refer to it in a general way. 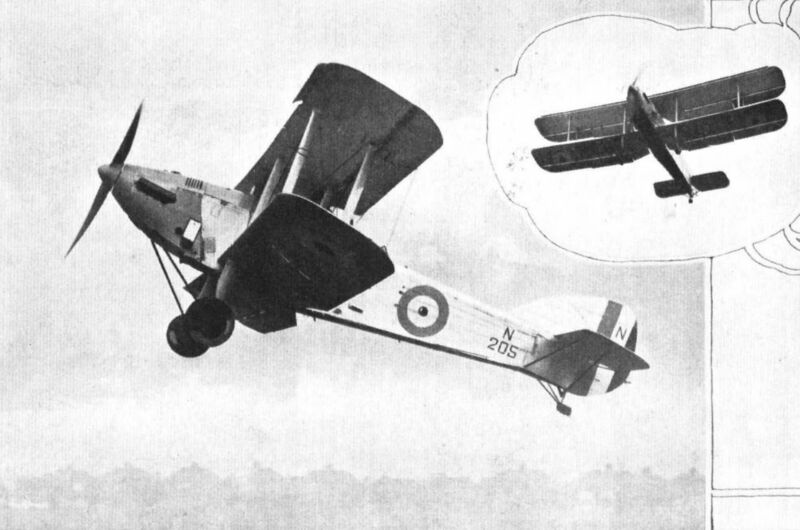 The "Harrow II" is a tractor biplane of fairly normal type, but in which quite obviously considerable care has been taken to "clean up" the aerodynamic design by reducing projections to a minimum. The nose in particular gives evidence of this, the tapering form offering a good entry for the air and causing a minimum of interference between the propeller and the fuselage. The two cockpits also indicate care in aerodynamic design, and are as nearly "faired in" as is possible in a military machine which has to have its rear guns exposed and its gunner able to stand up and fire. It is, however, in effect of the slots that the greatest interest of this machine lies. Full performance figures may not be given at the moment, but that the slots are effective (and, incidentally, lift slots as well as control slots are fitted) appears evident from the fact that, although weighing well over 7,000 lbs. "all-up," the "Harrow II" has a speed range of from 50 m.p.h. (80 km./h.) to 136 m.p.h. (220 km./h.) with full load, a speed range of 2-72 to 1. For the relatively heavy power loading such a range is remarkably good. At present it is not possible to say exactly what "useful load" the machine carries, but the fact that it is designed, either as a torpedo plane or as a bomber indicates that this load is considerable. THE aircraft is of the single-engined tractor biplane type, having two planes of equal span. The centre section is of large proportions, providing a rigid structure, and facilitates folding of the main planes. Construction. - Unless otherwise ordered, the aircraft is of composite wood and metal construction, the highest-grade materials being used, as approved for the British Air Ministry. Fuselage. - The front portion of the fuselage from engine to pilot's seat is of steel tubular construction, with tie-rod bracing, while the rear portion of the fuselage has spruce longerons and struts with wire bracing. The fuselage is fabric covered, no use being made of three-ply. Wings. - The wings and tail unit have spruce box spars and ribs, with internal wire bracing, the wing being fabric-covered. In order to facilitate and minimise the amount of housing space required, the aircraft is provided with wings which fold backwards along the fuselage, thus reducing the total span to 5-48 m. Two types of automatic slot are fitted - one providing automatic lateral stability and control, and the other giving a slow landing speed. The slots, being mounted on ball bearings, require no maintenance other than casual lubrication at infrequent intervals. Power Unit. - Although the aircraft shown above is fitted with a Napier Lion engine, the aircraft is designed to take the Bristol Jupiter engines, of Series IV, VI, or VIII. The engine mounting is readily demountable and most accessible, should it be desired to change from a water-cooled to an air-cooled type of engine. All carburettor air intakes are arranged to come out at the side of the engine nacelle, so that when used as a seaplane, no seawater enters the carburettor. Hand-starting is provided, and is accessible, when used both as a land or float seaplane. Undercarriage. - The undercarriage is of the oleo type, with rubber in compression. 900 mm. by 200 mm. Palmer wheels and tyres are fitted when used as a land-plane. The tail skid is of the non-steerable type, having rubber in compression, to absorb shock. When used as a seaplane, either a rigid or non-rigid float undercarriage is provided, according to the conditions under which the machine will be operating. 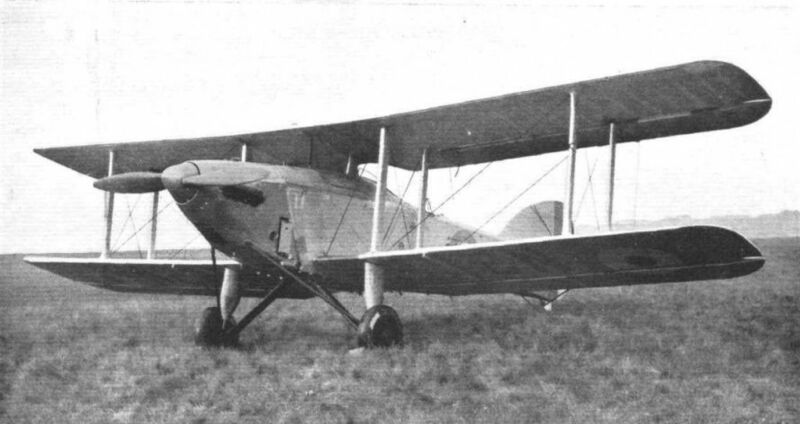 THE HANDLEY PAGE "HARROW II": Three-quarter front view. 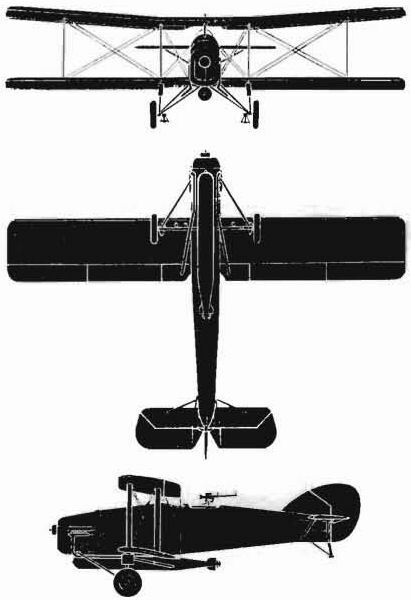 Reference to the original Handley Page works' three-view, E.A.I., dated from 22nd October 1925 to 20th March 1926, provides some of the data listed below, and shows the original 470-h.p. Napier Lion VA installation and the raised rear gun position as shown in the accompanying silhouette of the Harrow Mk. I. The photograph shows the Harrow Mk.II (N205) with the more powerful 530.h.p. Lion Mk.IXA. the re-shaped nose (plus spinner) and the cut-down rear fuselage. The H.P.31 Harrow was designed to A.M. Spec. 21/23 as a two-seat carrier-borne torpedo bomber. 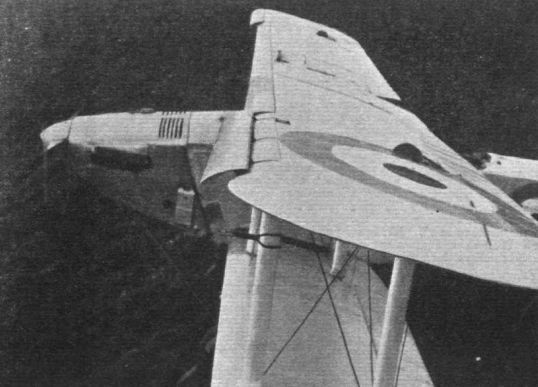 A second Harrow was fitted with a twin-float undercarriage and is claimed to be the first military seaplane incorporating the then revolutionary leading-edge wing slats - the patented Lachmann-Handley Page "Slot". The Harrow was otherwise of conventional design and of all-wood construction. The two-bay wings could be folded back to a mere 18 ft. for carrier stowage. Armament consisted of a .303-in. machine gun above the engine on the starboard side of the nose, plus the single rear gun . 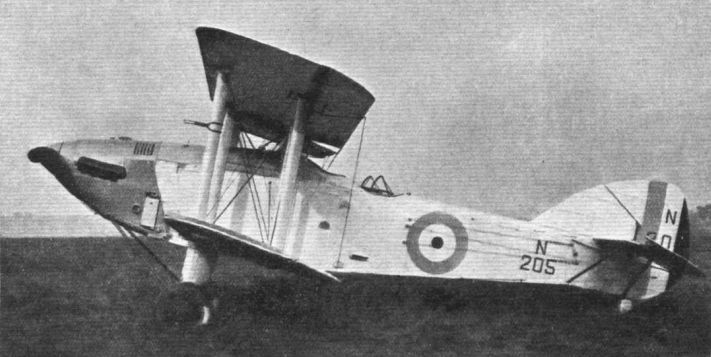 HANDLEY PAGE H.P.31 HARROW. Data: Manufacturer: Handley Page Ltd., Cricklewood, London. N.W.2. Harrow Mk. I (landplane: first flight, 24th April 1926). Power plant: one 470-h.p. Napier Lion VA. Dimensions: span 44 ft.; length 33 ft. 9 5/8 in. ; height (tail down) 13 ft . 3 in. ; wing area 563 sq. ft. Weights: empty 4.403 lb. : disposable 2.737 lb. (including 1,650-lb. war load); loaded 7.140 lb. Performance: maximum speed 115 rn.p.h, at 15,000 ft.; cruising 98 m.p.h. ; range 440 miles. Tank capacity: 160 Imp. gal.